Navam Perahera is the grandest outdoor parade on Colombo's events calendar, a full moon festival which treats spectators to thousands of performance artists in the streets and a parade of a hundred richly decorated elephants. 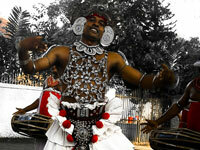 Many of Sri Lanka's traditional art forms are showcased at the festival, including folk dance and music, and there are other visual displays from fire twirlers, stilt-walkers, jugglers and the like. Dancers and drummers from around the country join together to take part in a magnificent procession of more than a hundred beautifully and elaborately decorated elephants, beginning at the Gangaramaya Vihara Temple, which organises the event, and proceeding around Viharamahadevi Park and the lovely South Beira Lake in Colombo. The festival, which takes place at night, under the full moon, attracts more than a million spectators every year and is popular with locals and tourists. Although not quite the kind of event that people plan international trips for, those travellers in Sri Lanka in February would do well to work this fun and colourful traditional celebration into their itinerary.